(SNN) When I was a young writer I did entertainment pieces for the Dow Jones owned, late, great, and lamented, The National Observer. That was a weekly national newspaper, now long out of business, but a prototype for the type of publication that reached fruition with USA Today. I was there when "The Gong Show"--hosted by Chuck Barris—who just died at age 87—debuted on NBC. I was assigned to review it. My problem as a reviewer was the show was pretty gawdawful, but dammit I enjoyed watching it. Call it a guilty pleasure, or a relatively harmless drug when taken in small doses. And, back before the deluge of similar programming inundated the current 800-channel Universe, kind of a rare deep dip into the world of marginally talented and tasteless entertainers. You could say it was “wink-wink” bad. Barry--who also produced it--knew it was bad, and let us in on the secret by metaphorically winking at us. He hosted with a "Hey, we're just having fun, y'know?" attitude and showed the smarty-pants tuning in that his kind of “bad” allowed him to laugh all the way to the bank. But I recall I did my critic’s duty by harrumphing at all The Gong Show’s faults, shortcomings, and affronts to civilization. I then added, "...and I wouldn't miss it if my house was on fire," to show everyone I wouldn’t be pushed around by the Good Taste Police. The review ran and I watched the show a few more times before tiring of it. On one episode, Barris read a number of reviews it had received on the air. He ended by reading the insults I’d hurled, paused and then reported that I’d added that I “…wouldn't miss it if my house was on fire." 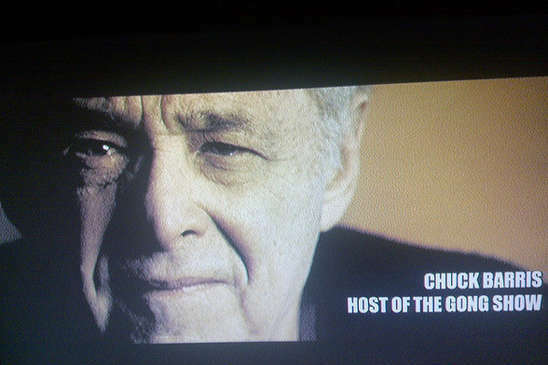 Then Chuck Barris roared with laughter, and I’m pretty sure he winked at me. Photo credit: Some Rights Reserved by Mohammad Jangda Flickr photostream. The Sage nor this article endorsed. The original image can also be found here.